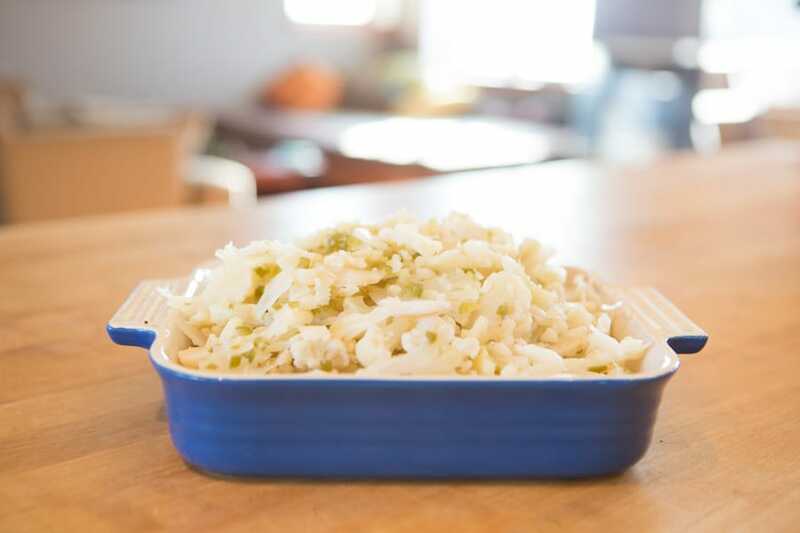 This sauerkraut recipe has become the most popular recipe on this site and for good reason. It has become my staple, my “go-to” kraut. 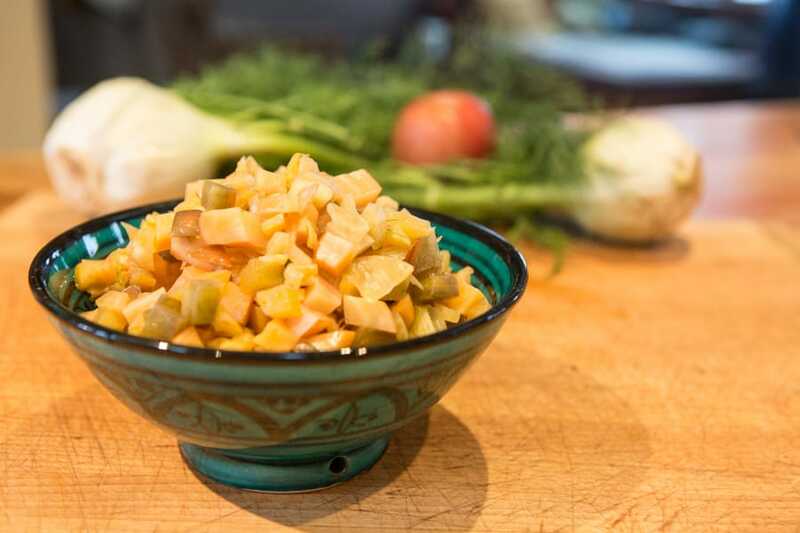 It’s a very simple ferment to make and comes out very satisfying to the palate. I’ve also learned that red cabbage has significantly stronger health-generating capacities than green cabbage. 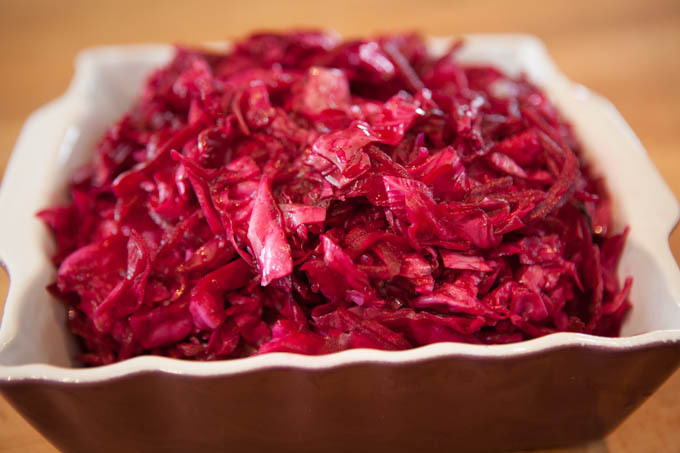 Aside from having 6-8x the vitamin C equivalent of green cabbage and powerful probiotic content, the deep color of red cabbage reflects a strong concentration of anthocyanin polyphenols, which have health benefits including anti-inflammatory and antioxidant capacities. 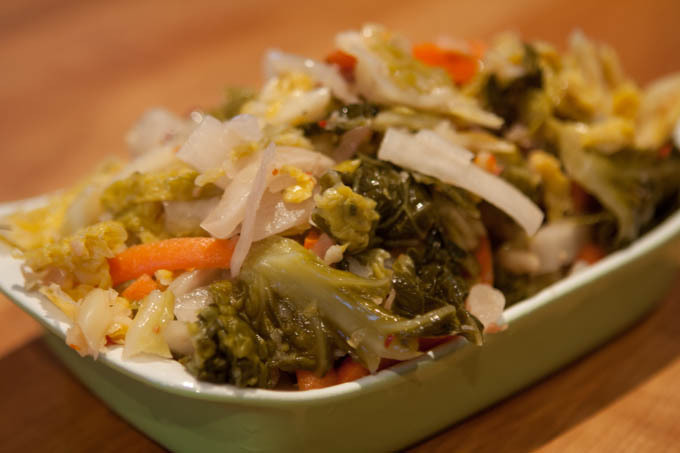 Cabbage, especially in its raw fermented form is also revered by some as beneficial in supporting the treatment of ulcers and other stomach and digestive related issues. 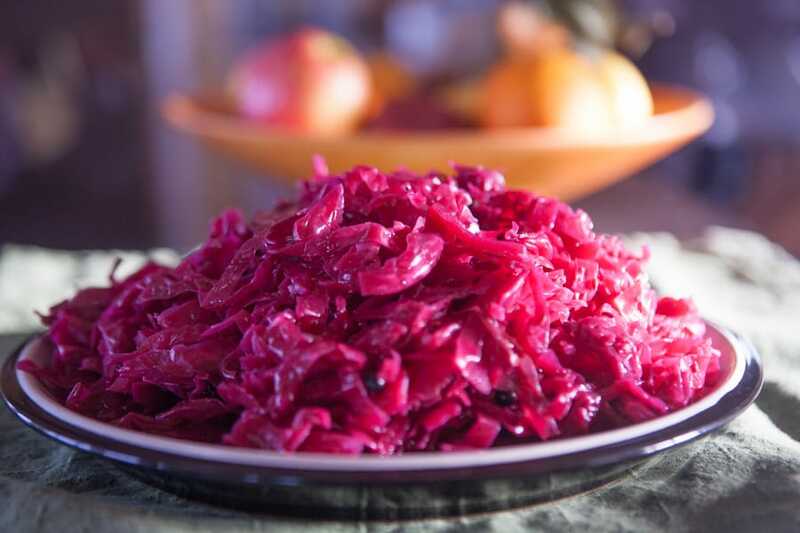 Although I’ve been vacillating as to whether to call this fermentation recipe purple cabbage sauerkraut or red cabbage sauerkraut, one thing is clear from my perspective, it’s delicious! 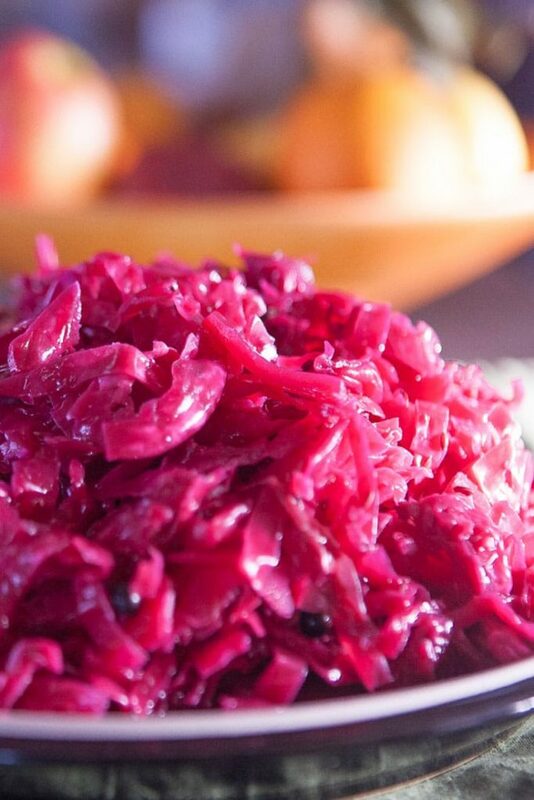 Sauerkraut made with Red Cabbage is far superior in my opinion. It's healthier and certainly more pleasing to the eye. Clean the cabbage - Begin by removing the outer leaves of the cabbage it they are looking a little sketchy. If they look fine, you should at least wash them off a little to remove potential contaminants. 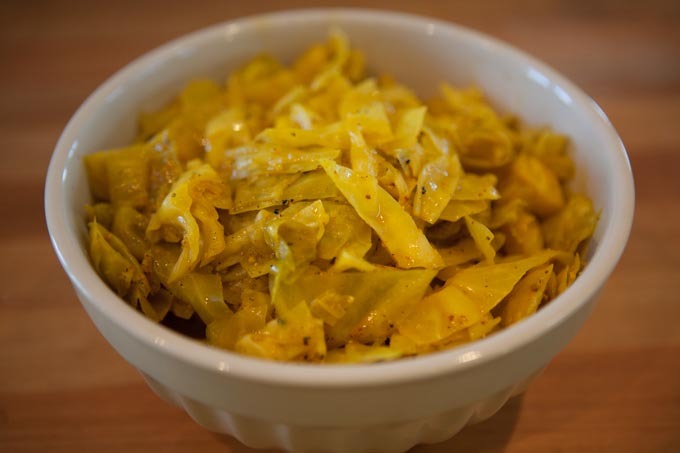 Slice the cabbage - I prefer to cut it in fat ribbons about 3/8 – 1/2″ wide. No need to grate it. I compost the dense nub that remains at it’s base. 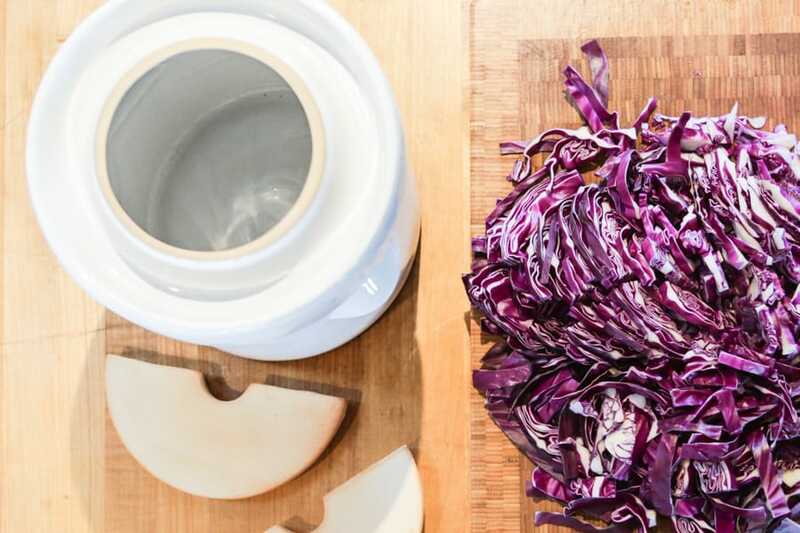 Place in a bowl and add salt and spices - In a large bowl, toss the sliced cabbage with the sea salt and let sit for 30 minutes or so until it starts to sweat. Add the juniper berries and caraway seeds as well at any time. Place in a fermentation vessel - Place everything including any liquid at the bottom of the bowl into a fermenting vessel. 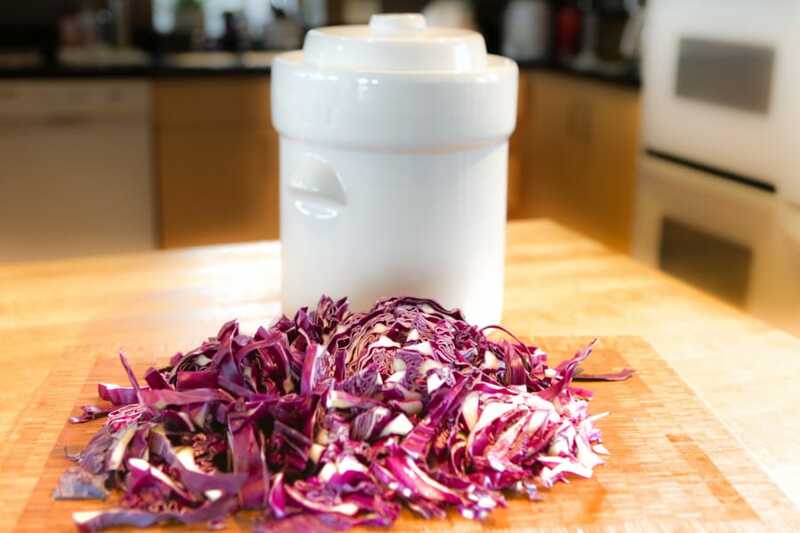 I prefer using a fermentation crock, but you can also use a 1 gallon jar or a mason jars with airlocks. Compress - Press down very hard using your fists or other implement. This compressor/pounder comes in quite handy. You’ll notice that you can squeeze out a little liquid which will pool at the bottom. After you tire of compressing it, place something with some weight on top of the cabbage to effectively continue pressuring the cabbage while you are resting. fermentation crocks come with weights for this purpose. If using a 1 gallon glass jar, using a zip lock bag with water in it can work well as a weight. The salt will help to leach liquid from the cabbage. Compress further if necessary - Over the next hour or two and try to get the liquid level up higher by compressing further. 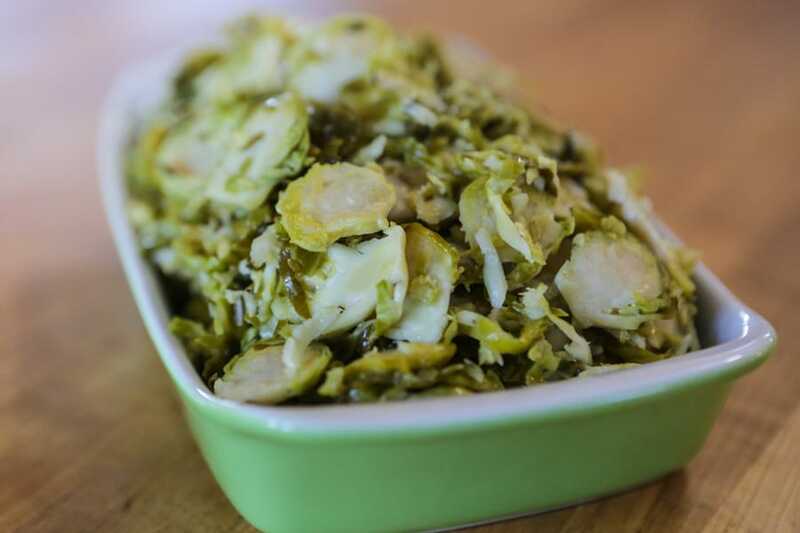 Your goal is to have the liquid cover the cabbage completely to provide an anaerobic environment within which the fermentation can take place. If, after several hours or overnight, you can’t get the liquid level high enough, add some water (without chlorine please) to cover by at least 1″. Stir well to equalize the salinity level. Place weight on it - If using a fermentation crock, place the included weights on top of the ingredients. If using a 1 gallon jar, my preferred weighting method is topping with a clear plastic bag filled halfway with water and tied closed while allowing the bag to remain loose (not like how they fill the bag tightly when you buy a goldfish). You can place that loose bag of water (make sure it doesn’t have any leaks) into your fermenting vessel and allow it to settle in and take the shape of the vessel. In that way, a nice seal is made around the edge to keep oxygen and other potential contaminants out. If using a mason jar, using an airlock such as this one is highly recommended. These are great weights if you are using the mason jar/airlock method. Cover - cover your fermentation crock with a lid, cloth or airlock depending on your choice of fermentation vessel. Wait impatiently - Let it sit for a minimum of 2-3 weeks. You can easily leave it for 6 weeks or even months if desired. It will simply become more tart over time. 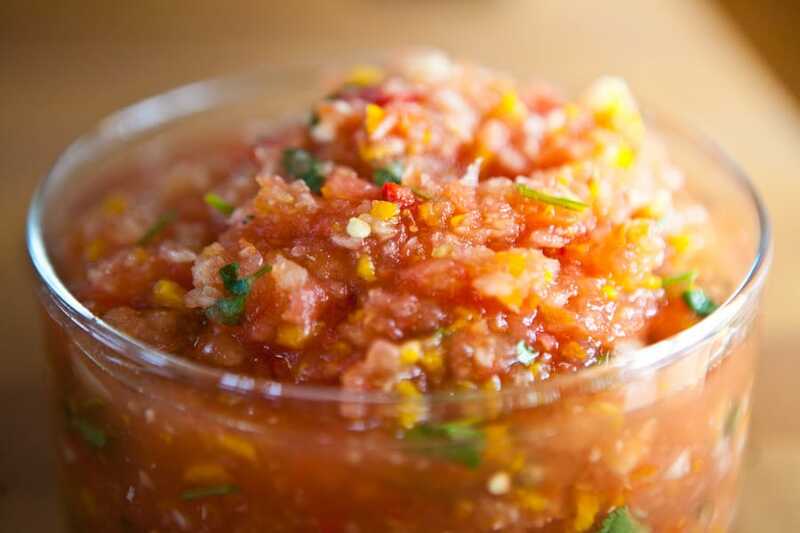 Jar it up - Once it gets a nice tangy flavor and you feel it is ready, place it in the refrigerator. I prefer to place it in mason jars first so they are ready to hand over as gifts as desired. 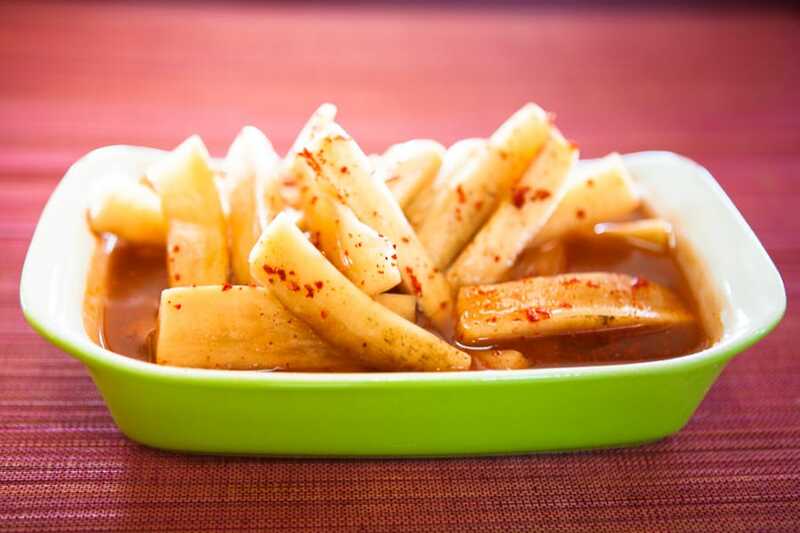 Great as a side dish, tossed into a green salad, in a tortilla or on a dosa with almond/cashew butter and avocado. Delicious on a veggie burger, as a beautiful colorful filling when making healthy sushi rolls. When I started this sauerkraut, the initial pH was about 5.8. After a few weeks of fermentation, the pH had lowered to 3.35. It’s not a requirement that you measure the pH of your sauerkrauts, but if you find the science aspects of fermentation as interesting as I do, you may want to invest in a nice digital pH tester. Besides testing your veggie and alcohol ferments, it can also come in handy with kombucha making. Ted, this looks great. You’ve just convinced me to add a juniper to my edible forest garden too. I’ve done similar recipes but put lemon zest and lemon juice in…extra yummy. Wow, 2-3 weeks! Unless those spices slow it down, you must really like it sour! I start refridgerating and eating mine after 3-4 days. I usually do more of a curtido, with carrots, a little onion, a couple chilis and oregano added to the cabbage. I will try this recipe though, juniper and carroway sounds nice! You are missing out on the important second ferment. It may taste fine, but the health benefits are not there if you only let it sit a couple of days. I ferment mine for 12 weeks and its not any more sour than its after 1 week but the probiotic bacteria count has increased by millions. Fermentation requires 3 stages. After 3-4 days you haven’t even completed the first stage. Going through all stages insures that any unwanted bacteria has been killed. It takes at least 3 weeks to go through all 3 stages. I let mine ferment for at least 6 weeks, if not longer. 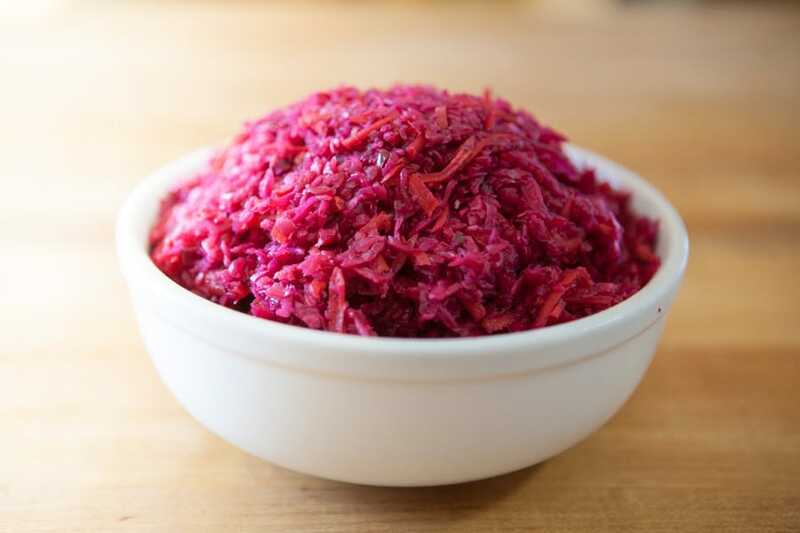 After trying the Red Sauerkraut I will never go back to the green…SOOOO Good! And I read 7X more nutritious. Anyway it continues to ferment a bit in the fridge! Mine is also ready after 2 – 3. Days! I live in Oman where it’s hot so it ferments too quick! However it’s perfect now in Jan Feb when it’s cooler! 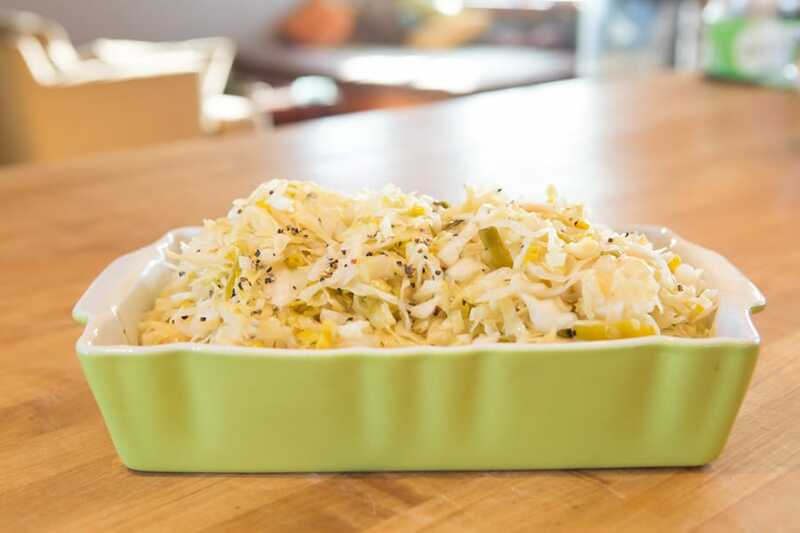 Yes, caraway seeds give sauerkraut (“pickeled vegetable” in German) a wonderful taste! Thank you for a nice recipe. 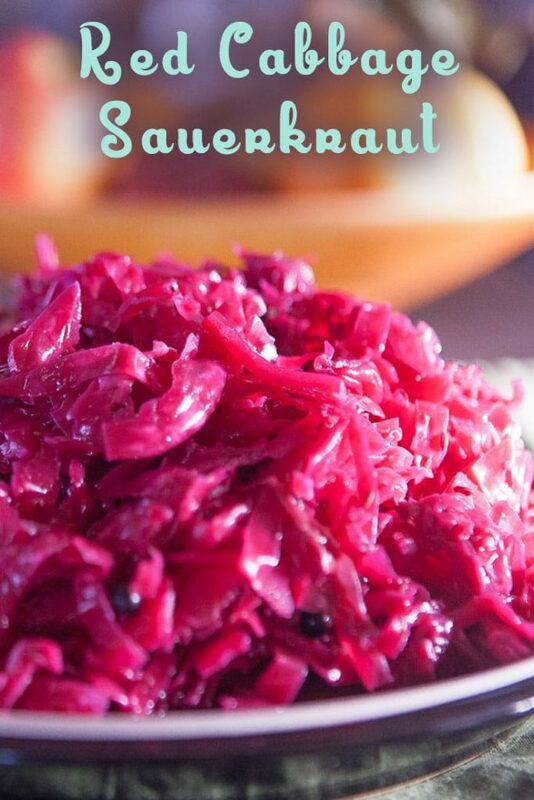 I’ve fermented cabbage a lot but never tried red sauerkraut. I will try this recipe next time I ferment. Is there an alternative berry I could use…I have never seen juniper berries for sale at any of my grocery stores. Thank you for the recipe! You’ll find juniper berries in the spice section. They are usually dried and in jars (or bulk). You can forage juniper berries in your neighborhood too if there are landscaped lawns with hedges. They aren’t on the shelves here (I live in Wyoming & other than in Jackson Hole we’re a bit behind the times unfortunately…don’t get me wrong though, I LOVE my state.) I will check on the mountain for fresh and look online for dried juniper berries. Thanks for the tips! At least you live in one of the most beautiful places in America. I love Wyoming. 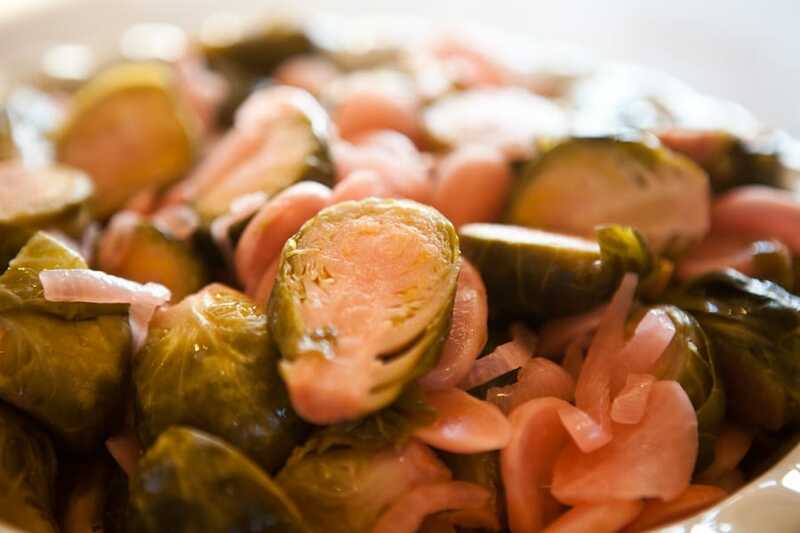 You’ll be fine making Sauerkraut without Juniper Berries too, but it is a traditionally used ingredient. Good luck! Yes I do! I love my home state too, its an amazing place. Okay…I will try to find them online if I can’t I’ll just omit it. If I like the recipe I will just have to plant some juniper bushes next year. Thanks so much for your help! Safeway has them in the spice section… Mr D’s also… you will have to look but they are there. 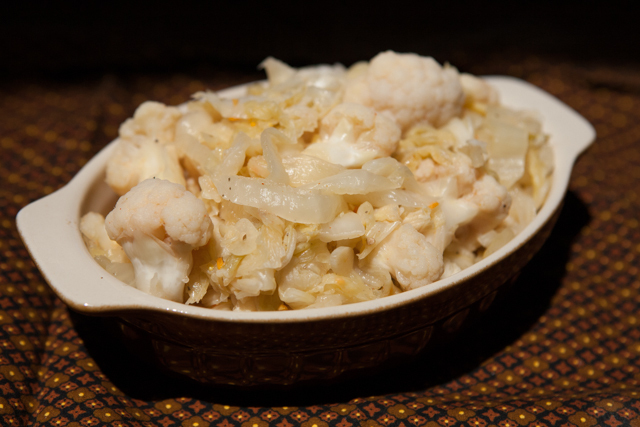 I’ve never made sauerkraut before and was looking for some recipes. Yours looks and sounds delicious, I’ll know in a few weeks. By the way, I was quite surprised to learn you’re in FB, I’m in Point Arena. Small world isn’t it! Hey Rita, nice to meet you. Hopefully our paths will cross in the near future! Good luck with your krauts! 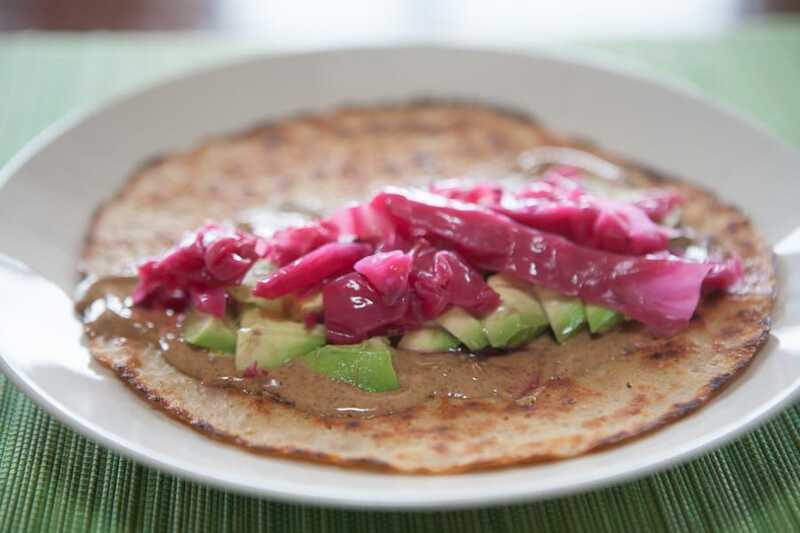 Tried this receipe the other day – delish! Thanks for sharing. Hi. Just found your website. Love it! One question. When you say “1.5T salt” is that a tablespoon or a teaspoon? I’ve been diagnosed with gastro reflux that affects my throat too. 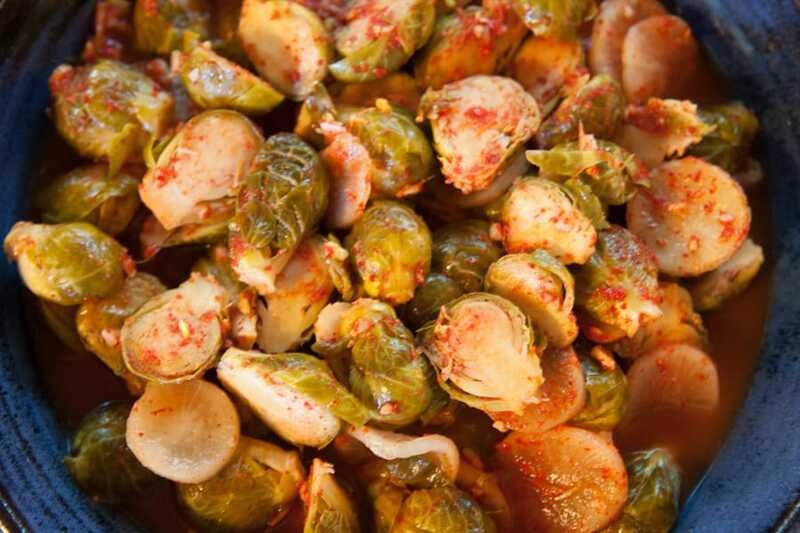 I love fermented food like kimchee and pickles especially ginger and lime pickles. Would eating them aggravate my condition? The doctor did say I need to avoid hot, spicy and oily food – that leaves me with boiled and steamed dishes options. Good luck and please write back with how things go with you if you decide to add probiotic foods to your diet. I find that pickle ginger soothe my throat while citrus drinks make me difficult to swalloW. I’ll drop by again sometime to update you with my progress (bought some napa cabbage & kale to make kimchee and purple cabbage to try your sauerkraut recipe today). 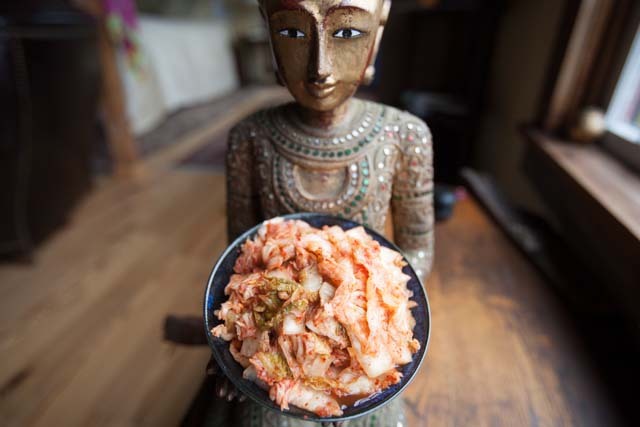 I have just been advised to eat sauerkraut and kimchi to cure my acid reflux – i have been on drugs for 3 years – which tho they helped, have wiped out my gut bacteria – so tho I have always HATED sauerkraut, I am now loving it – and if `i feel a reflux coming – a spoonful sorts it out very swiftly, quite amazing. Soused herrings are good for it too. 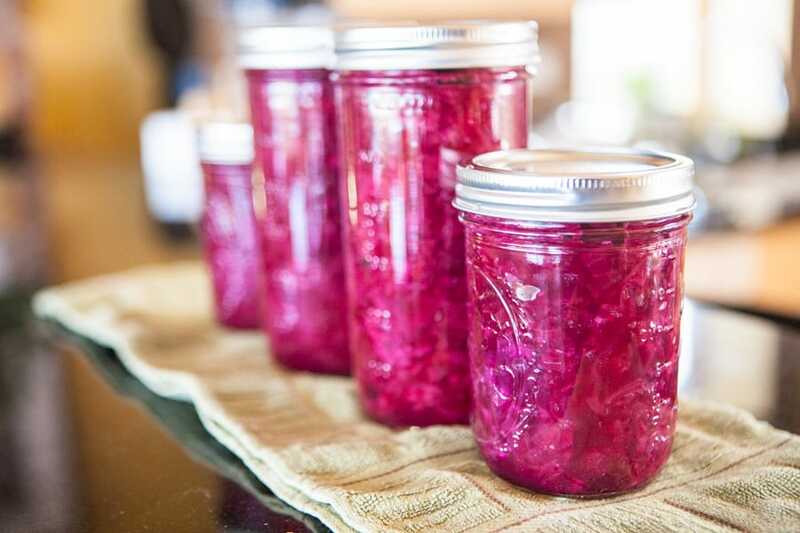 – but I am having trouble with my first attempt – making the easy red kraut….maybe my jar is too small, and I think I didnt keep the air out properly – if a little hairy mould appears on top – does that mean I have to throw it all out??? If a hairy mold starts to grow, I would recommend throwing it out. If you are more daring as I tend to be, you can remove the moldy layer, then mix it all up again and see if the mold comes back In a few days. If it doesn’t, you’re probably fine. My first batch I left to ferment five months…. really, really, really good. My second batch (that I’m currently waiting on will go for six. Sounds great! I’ll have to try that too! I read that ferment times can be as little as two weeks. My first batch went for five months… so good. I’m currently working on my second batch and I;m going to let it go for six. I read that one person had a batch that had been overlooked in a cellar. Said it had been put up in 1999 ( I think the post was made in 2014.) Said it looked good (had been put up in jars) so they tried it. Said it was the best EVER. Hi Ted, I have followed your instructions but I am not getting much liquid after 12 hours of compressing the cabbage and spice mix. 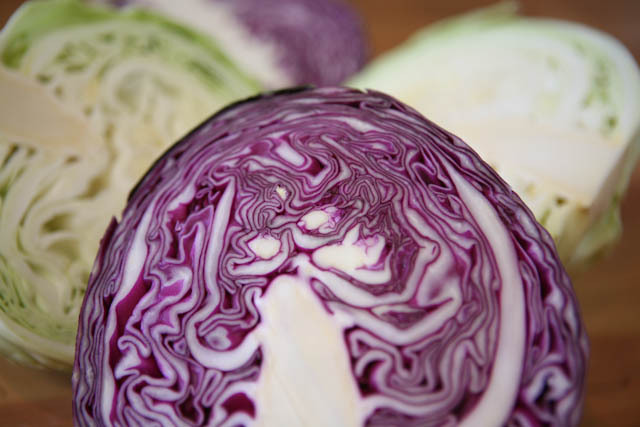 My cabbage is home grown red cabbage, the salt I used is coarse Celtic sea salt. Am I doing anything wrong? It’s hard to know for sure if you’re doing something wrong. Since the salt is coarse, it won’t have as much surface area contact. Have you tossed your ingredients around now that it’s been sitting for awhile? This would ensure that the salt would dissolve and then have an ability to impact more of the cabbage as far as how much water is being released. Did you use more salt since you used coarse salt. I have a note in my post: https://www.fermentationrecipes.com/using-measuring-salt-fermentations/1014/ which mentions this: “Please note regarding the use of kosher salt – when measurements in Tablespoons are used in this article, that the salt used is a normal grained sea salt or table salt. For courser grained salts such as kosher salt, there is less salt by volume since there is more room for air between the grains. This of course depends on the size of the grain, but a good rule of thumb is that if you are using kosher salt, use 25% more by volume.” Perhaps you need a little more salt? It’s also possible that your cabbage simply isn’t as dense and heavy with water as other cabbages are. If you salt quantity is good and it’s been sitting awhile, you can always add more water. No need to add salty water as the salt you’ve initially added should dilute and disseminate throughout the ferment. Hope that helps! Good luck. Report back if you can. I read in so many recipes that you were only supposed to use canning/ pickling salt, Kosher salt or sea salt… NEVER table salt because of all the additives. Good point Mike on the salt. I’m sure you can get away with using table salt, but it does have additives which are better avoided. I always use sea salt in my ferments. Some sea salts are an excellent source of trace minerals which are good to ingest as well. Do you ever use raw honey in your mix,?I’ve found its great and it’s a good starter boost for the fermentation. Interesting idea. Does the honey impart any flavor to the final product? Why do you say it’s “great.” Always curious over here. Thanks! kraut turning brown afyer one week. what is wrong? It’s hard to say. Is the entire kraut turning brown or just the surface. If it’s the surface, then it may be oxidizing some. Is there Iron in your water? The Iron can oxidize too which might turn things brown. Any other details would be helpful. Wow, I wasn’t aware there were any nutritional differences between green and red cabbage. That’s really interesting! 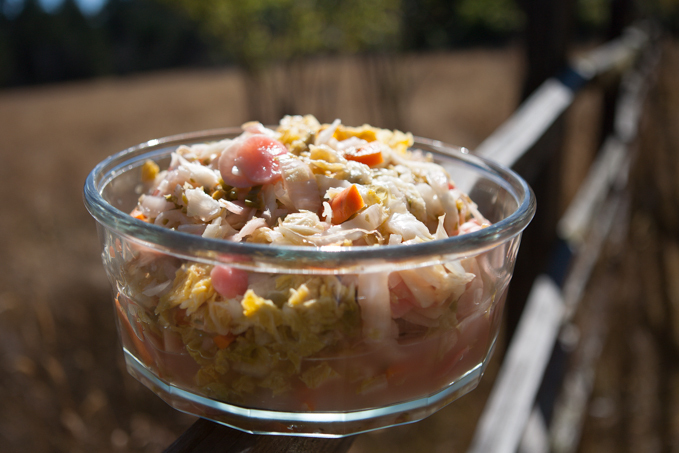 In my opinion, there’s few foods tastier than naturally fermented sauerkraut; I definitely need to try your recipe. Can you give the cabbage amount by weight? The red cabbage at my supermarket is huge, but the red cabbage that is locally grown at my co op is pretty small, so two heads of large vs two heads of small would make a big difference. Good point. My suggestion is to use approximately 1 TBSP of salt to every 1 1/2 pounds of veggies. 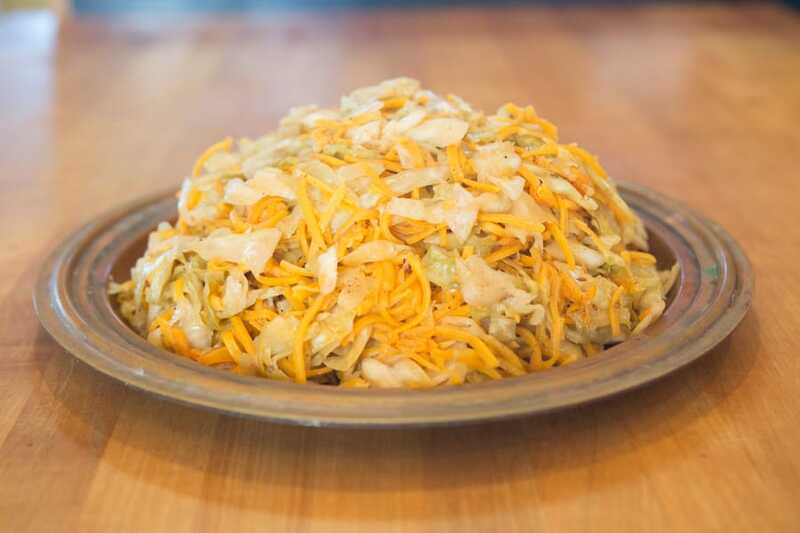 You can weigh your own cabbage and add salt in that ratio. Good luck! Oh my! This is so good. Fermented for about 3 1/2 weeks in a clear cookie jar. Used a 1 gallon zip lock bag as a weight. It looked very nice sitting on the counter with that deep purple color. 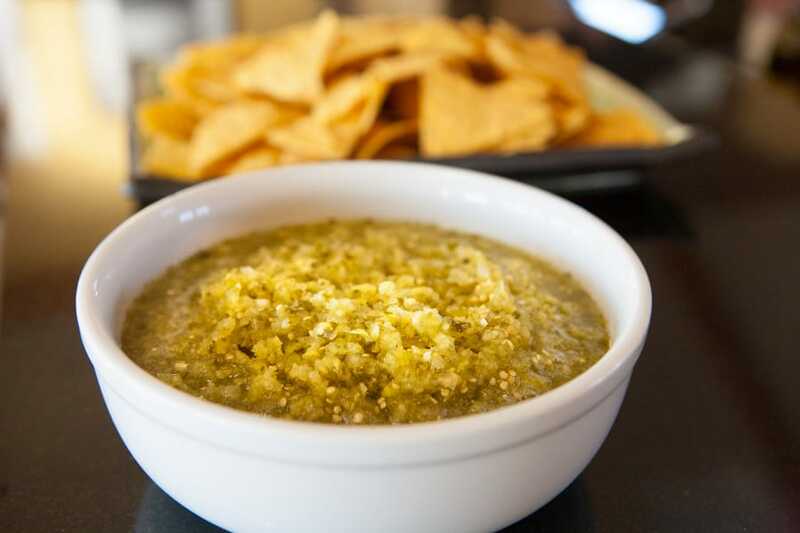 It is a big hit with everyone who has tried it. 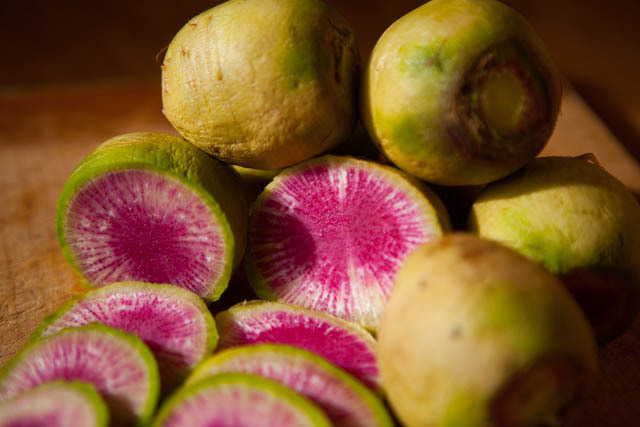 Makes a nice side dish (cold) or even just as a snack. Thank you for this recipe. Thanks Michael. This recipe now has a print option attached to it. I’ve been slowly migrating all of my recipes to a more printer friendly format and now this one has it too! Thanks for the shout out. Much appreciated. Good luck! 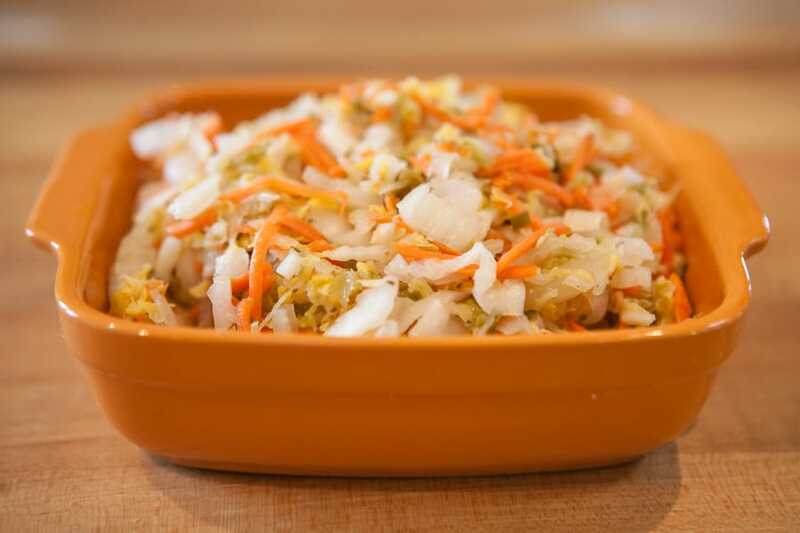 It has been two weeks and my kraut is has been fermenting, but it is so salty….I have an idea, can I add more cabbage at this point and allow it to ferment with the first batch and not add as much salt? That should be fine. You’ll need to leave it a couple of weeks more. The other option is to take out half of the cabbage and rinse it off in a colander and then put it back in. You ncan also pour out part of the liquid and replace with unsalted water. Good luck! Juniper berries may be growing in your neighborhood as they are quite commonly used as hedges for landscaping. You’ll need to do your own research to identify them. Here’s a link to some on Amazon if that’s helpful: http://amzn.to/2h8kBAI. My local small grocery has them in bulk so yours might too. The berries aren’t critical to the fermentation but they do add flavor. In other words, you can do without them if you like and add other spices which might please your palate. 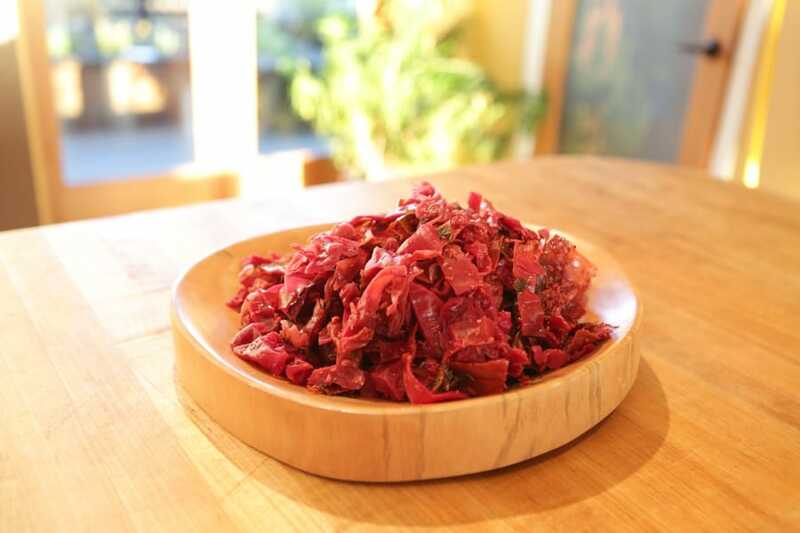 When the kraut is transferred to the fridge, does the brine level need to cover it? Without a weight, mine is exposed to the air in the jar. Is that ok? Thanks & BTW I love it. Tastes amazing. It’s best if it remains covered by the brine, as mold or yeast growth on the surface can develop. Glad you’re enjoying your kraut! Saz, I wouldn’t worry about it too much if you’re going to be using it. The cold of the fridge, the salt, and the acidity that have developed will protect it fine for a few weeks or even months. If you are storing it more long term it’s more important you have have the layer of brine, or alternately a blanket of CO2 which will have developed during fermentation (a fido jar is an easy way to maintain that). hi ted! with the leftover juice, providing it has the right ingredients to begin with, Is this how you can make fire cider or tonic for fighting cold/flu ailments? Here is a link to a fire cider type drink which is made with a vinegar base. You can also make an “elixir” from your sauerkraut juice too, especially good when made with healthy ingredients. Good luck! Is 15.98g sugar a typo? It’s not a typo, but I can’t fully vouch for it’s accuracy. I use a service that automatically converts recipes to their nutritional value. It’s definitely not “added” sugar, but likely reflects the natural sugars in Cabbage. My hunch says that the fermentation process consumes those sugars so that 15.98 number you refer to is likely high. Wow I figured cabbage must have sugar but had no idea it was that much. Sure enough I looked it up and a medium sized cabbage has 29g! 1 cup of sauerkraut has 2.5g. I’ve been making sauerkraut for years. I always canned it never even thinking about killing off all the probiotics. I saw this recipe and decided to try it. I picked a handful of juniper berries off my tree and washed them. I had to add a little extra water so also added a little extra salt. After about a week I saw a little white mold around the edges. I cleaned that but then the whole top started molding. I had to throw the whole thing out. Evidently I got some type of contamination. Just curious if it might have been the fresh juniper berries or should I have boiled the water before adding? We are on well water. Thank you Ted for the great website. PS I made the kimchi and currently have dill pickles going, both with no issues. hi Betty, my hunch is that the Juniper berries perhaps harbored a mold or perhaps more likely a natural yeast on them which somehow took hold in your ferment. I doubt your well water would be contaminated with either a yeast or mold.